Marine Corps veteran Matias Ferreira is the first active-duty, double-amputee police officer in America. Ferreira was serving in the Marines on a detail in Afghanistan. He stepped on an improvised explosive device (IED) and lost both of his legs. They’ve been replaced with shiny new titanium legs and he’s learned how to use them very well. 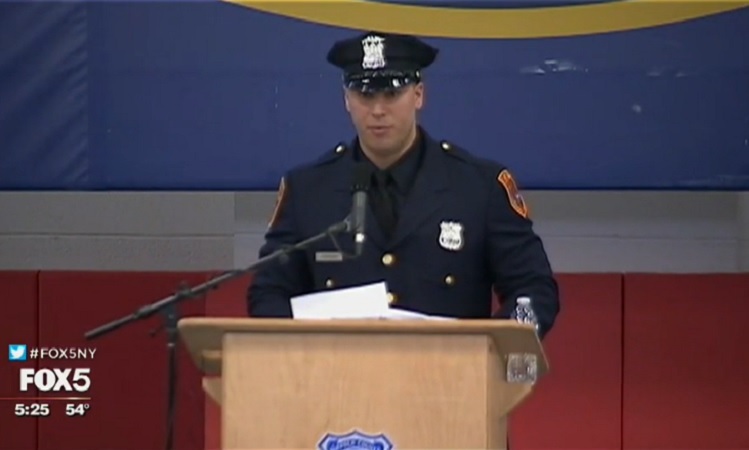 Ferreira attended the Suffolk County Police Department Academy and graduated. He has set a new level of standard, grit and toughness upon us. He was up for the challenge and he succeeded! If that’s not inspiring, then what is? Here’s a man who suffered an unimaginable injury fighting for his country and now he’s back fighting again. This is a man you can’t keep down. You can’t keep a good man down! The Suffolk County Police Department believes Ferreira is not only the first active-duty, double-amputee cop in the agency, but also in the entire country. He said he doesn’t think the prosthetic limbs will inhibit him from carrying out the duties of a police officer. Not only does Ferreira have that true American toughness, but he also has quite a sense of humor. For him to be able to joke about his condition and persevere through injuries that would make most men miserable, he’s the shining light of hope and inspiration that many American’s need. Ferreira has mental and physical toughness that make him a great candidate for the job of a police officer and an inspiration to many of us. This guy is legit! Whenever you’re feeling down about yourself, just look to Ferreira for motivation. This man went through the police academy on a set of titanium legs. If he can push through that, then you can push through anything!